Welcome to the PERI portal for press releases. Here we keep you updated on the latest projects and developments in our company. For further questions regarding text or graphic material, please contact our press office. 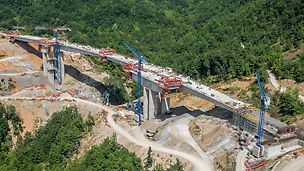 The international BUDMA Construction and Architecture Fair is one of the most famous trade fairs in Poland and focuses on construction industry developments from around the world. Every year, after a thorough and rigorous evaluation by a team of experts, the coverted gold medal – one of the best-known awards on the Polish market – is presented to innovative products of the highest quality. The Aglaya high-rise building is situated in the so-called Suurstoffi area in Risch Rotkreuz next to Lake Zug. In a unique way, it combines the increasing desire of living in a green environment with careful management of building land resources. PERI planned and delivered a scaffolding and formwork solution to meet the difficult formwork challenges of this flagship project for realising a future-oriented living environment. Weissenhorn / Munich. 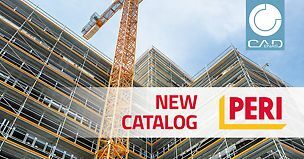 At the industry´s leading international trade show from 8th to 14th April 2019 in Munich, PERI will be showcasing numerous new developments for formwork and scaffolding technology to customers and visitors alike. The focus is on innovations, practice-oriented system supplements as well as further developments which cover a wide range of applications and target groups. An important feature of the company´s trade fair appearance is that of digital solutions along with the comprehensive range of services that PERI uses to make project realisation regarding all aspects of formwork and scaffolding more economical and safer for all users. 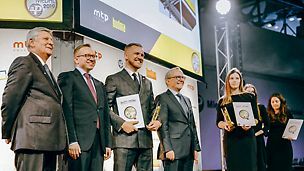 Weissenhorn-based formwork and scaffolding manufacturer, PERI, has won the BAKA Product Innovation Award 2019. Gunther Adler, State Secretary at the Federal Ministry of the Interior responsible for construction and homeland affairs – together with Dr. Ing. 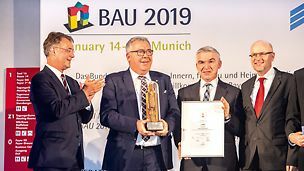 Reinhard Pfeiffer from Messe München and BAKA Chairman Ulrich Zink – presented the award in front of around 800 invited guests at the BAU 2019 in Munich on 14th January. The special award was accepted on behalf of the company by Bernhard Überle, PERI Sales Director Germany, and PERI Sales Manager, Helmut Sterflinger.